Furniture Painting…Again – 3rd Times the Charm? Do you ever stare at something so long you can’t decide if you love it or hate it? 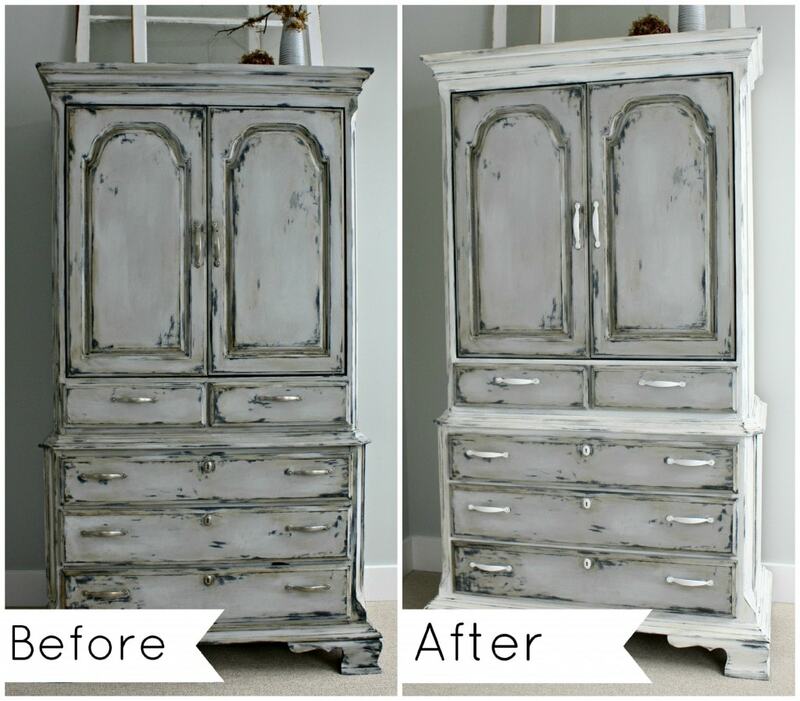 Remember my post on How to Annie Sloan Chalk Paint? I was a little disappointed that the color was so close to my walls but I could not face the 45 minute drive with 2 crabby angel children back to my nearest Annie Sloan stockist. I finally made the trek again because I’m working on my little man’s big boy room (can’t wait to share in a week or two hopefully…ok probably 3 :)) and needed some Napoleonic Blue paint. Spur of the moment I decided to pick up a can of Pure White too, you know how I love my white paint, so I knew I would use it somewhere. And then, like I do, I wandered around my house, paint brush in hand, wondering what I could paint. I remembered that my friend Allison from The Golden Sycamore and I had been talking about how painting either the drawers or the trim of my bedroom furniture would make it pop a little (thanks Allison!). So I went to town, and wasn’t so sure about it. So I painted the hardware too, and I’m kinda loving it now! It feels brighter and beachier and after staring at it every time I walk by I think it’s no longer a love/hate thing, it’s a love/love thing. BUT now here is my dilemma, does it work on the piece below? What do you think, do we love it, or not so much? Really! I’d love some opinions on this one. I don’t really like when furniture is matchy, matchy but I’m not sure what else to do to make it work. So leave me a comment with your opinions, I’d love to hear all the fab design advice you have for me! Oh and I want to quick tell you about the super fun post I’m working on for Monday – have you guys ever been to a progressive dinner? Well, consider yourself cordially invited to one! 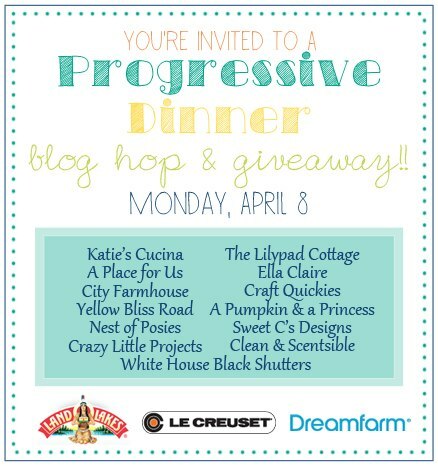 Some of my favorite bloggers and I are getting together for a little virtual progressive dinner, you will be able to hop over to every blog for a different course and great recipe. The best part? There is going to be an amazing giveaway opportunity for you from our awesome sponsors Land O Lakes Butter, Le Creuset and Dreamfarm! Really, amazing, you are definitely going to want to enter! Now I need to get cooking, I’m in charge of the main dish eek! Hope to see you all there! I think it looks really nice. I went back in and looked at the master bedroom from the house tour and you have non-matching night stands and the bench at the end of the bed so there are plenty of pieces that don’t match. I think it works. Thanks Jamie, I might stick with it for a while, can’t live without changing things up for too long ha! I love the contrast! What a difference that made. It was pretty before but even better with the two colors. 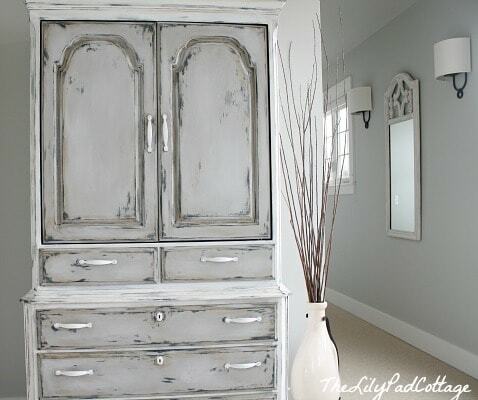 I love that you used the white on the main parts of the cabinet and the grey on the drawers. It looks great against the wall color. Your bedroom is so pretty. How lucky you are to have that view. Beautiful! Thanks Becky, I do love the view, especially now that the lake is melting again yay for spring! Love this!What type of black paint did you use when first painted was is a Chalk paint,the black a flat,what finish was the peice originally? Just regular old latex paint, I think it was satin? I would do the other piece all white if you want some contrast. 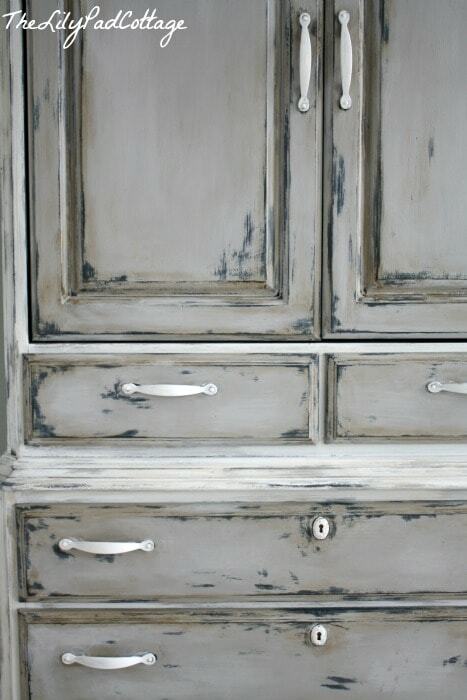 I did a very similar color combination on a long dresser I have except the hardware is a Venetian Bronze. It looked goofy in one room, but I’m using it now as the anchor in our living room and it works. I really like it on your armoire, maybe just do something else with the hardware? funny how something that works in one room doesn’t work in another, I need to put my thinking cap on! I’m with sue…all white for the short dresser. You know I love it, Kelly! :) I like that the pieces match, actually. I love painting every piece in a room a different color, but it can get busy looking really fast. I think if two pieces match like this it’s totally okay. They kind of anchor the room and you can play a little more with the other pieces in the room. How about painting the top and hardware black? It would tie in but add a lot of pop! I love them both just the way they are :) wouldn’t change a thing! I love them both! At first I was thinking the top of the dresser would look cool white, but I think if you replaced some of the decor with something bright, with a pop of color, that just might do the job! I LOVE the pieces. Just as the are. I have a 20’s set that this concept is planned for now. I painted them gloss white when they were in my daughter’s room. Now they are mine, back to original stain that does work with our black and off white damask set. .
Hi Kelly…I was searching for colors to paint some bedroom furniture and came across yours! I love it, but I agree about the color. When I first looked at it, it seemed to all kinda flow together? Maybe the lettering in deep red, or all the accessories color them up? I’m tackling a $50 Habitat for Humanity find, made in 1978, solid wood Thomasville armoire tomorrow, going with white. Love your taste! Love it!!! What is the name of the gray color?? ?did you use clear wax? can you please tell me how you got this look? I love it and would like to fix up my 2nd bedroom..thanks..
Hello there! Wow both pieces look amazing. I am interested in trying something like this myself with an armoire and dresser that are similar in size (but less ornate) to your pieces. I was wondering if you could point me in the right direction to technique? And also what are the names of the paint colors you used? Thanks!! How do you make it work? It’s perfect…truly. I love it! This will be my 3rd furniture DIY and I’m still learning all the tricks. I’m wondering, did you use a glaze for this project? I’m LOVING IT!!! You truly do an amazing job… Now only if I could learn how to do this:/ Any advice on how? I’m always in awe of your taste, I love it. Thanks Pauline, the same goes for you! Love all the amazing things you create! Hardware needs to be dark charcoal gray…….could spray black with a dark gray luster stone from faux effects then topcoat with c500. Deeper and richer look. Kelly- I think one of the pieces with the white on the trim is good– not sure I like it on both. I was thinking the more horizontal piece could just be the distressed paris grey all over. This would make your taller piece stand out. Also, you have a lot of things on top of the buffet so with just the straight distress and no white, it seems it would be less busy. Can you tell me how to recreate this work? What layers of color did you use? 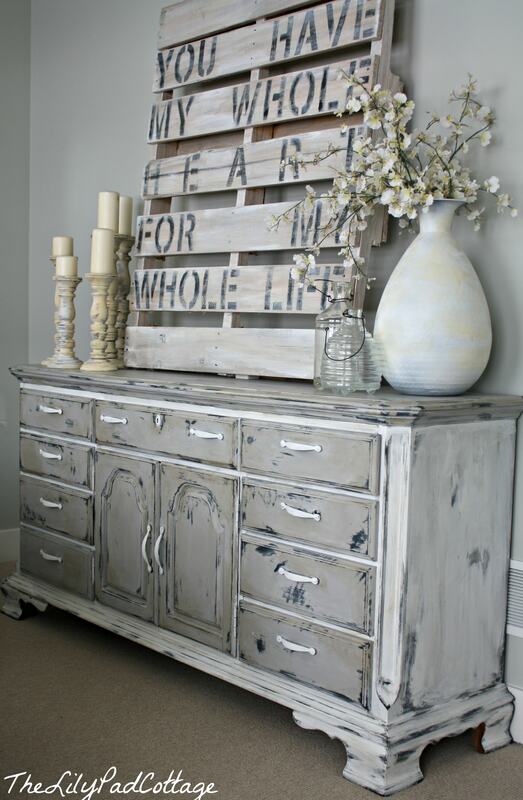 I really liked the white, off-white combination in your painted furniture. Thanks for the idea! How did you get the dark parts? Is that done with dark wax? The dresser started out black so some of the dark part is that original color showing thru but there is also dark wax on it. Its quite beautiful, it works!!! You nailed it! It really took the piece to a new level. Where did you purchase this armoire? Kelly, I love your style! I’m an east side Michigander. 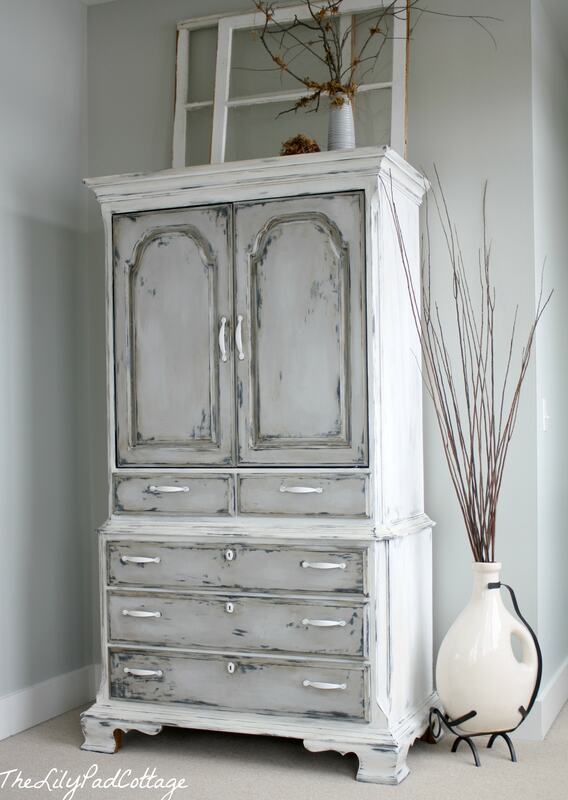 I have an old Thomasville dresser and armoire set just crying for an Annie Sloan makeover. I am nervous about trying it (hubby’s not on board), ‘tho I KNOW it would be as amazing after seeing yours! You have a beautiful ‘eye’ for change. Thanks for the inspiration!